Engineering Excellence Evangelist passionate about enabling organizations to improve by cultivating a culture of continuous improvement at all levels, using Agile, DevOps, Continuous Delivery, Lean and data-driven decision making. Although a nerd at heart, she has almost a decade of experience in coaching the entire organization in doing product development with a focus on adding business value. 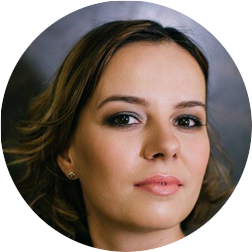 In her spare time Nataliya is co-organizing the Go Agile! Stockholm meetup. Many organizations are operating in a very uncertain and volatile environment, so-called VUCA world. That means that product strategy evolves with time and can’t be top-down even if it’s brilliant. But how can we adapt to changing strategy on the organizational level and experiment with our hypotheses on a daily basis? The answer is by organizing our teams around customer success, e.g. becoming outcome-oriented. In this talk, we will learn how to organize to become outcome-oriented, what outcome-oriented teams have in common, and what kind of leadership is needed to support the teams in this transformation.